Diagnostics are critical components of veterinary medicine, and aid in the detection and treatment of illnesses. As part of our diagnostic services, The Animal Clinic of Billings and Animal Surgery Clinic are equipped with digital radiography for both general and dental X-rays. We also maintain a full in-house diagnostic laboratory that is cutting edge to provide faster results with more accuracy. This helps us provide our patients with immediate and more effective treatment. Veterinary diagnostic imaging includes radiographs (x-rays), ultrasound, MRIs, Doppler Echocardiograms and CT scans, all of which are used as diagnostic tools to collect information on your dog’s health. The vast majority of imaging is non-invasive and completely painless. However, some imaging, like MRI’s for example, require sedation or even anesthesia because the dog must be kept completely still to allow for adequate images to be produced. Our veterinarians are then able to use these images to collect information on your dog so that we may establish if medical or surgical care is needed and the best course of action to take. 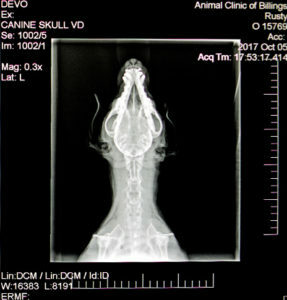 Dog x-rays have been in use throughout the medical community for many decades. Dog x-rays are by far the most regularly used form of diagnostic imaging in the veterinary industry because they are cost effective (comparatively speaking), and they can accurately diagnose the state of skeletal structures and broken bones, large body cavities, or the presence of foreign objects by examining your pet’s bones, lungs, heart, abdomen, oral cavity and other areas of the body. An x-ray can also detect tumors, or even help with the diagnosis of heartworm disease. When used in conjunction with other diagnostic procedures, such as ultrasound, x-rays can accurately diagnose problems otherwise difficult to detect, making treatment faster and easier for your dog and your veterinarian. Animal Surgery Clinic of Billings patient with two broken femurs, repaired by Dr. Brown. We’re happy to report the dog is getting along great now. Today, digital radiography has become the gold standard for how radiographic images are obtained. Digital radiographs (x-rays) are extremely helpful for diagnosing and monitoring many medical and surgical conditions. At the Animal Clinic of Billings, we offer digital radiography for both general and dental X-rays. Digital X-rays are preferred because they create significantly less radiation to the patient, and no harsh chemicals are used. The digital images produced have better clarity, are ready to view within seconds, and can be shared instantly via email. 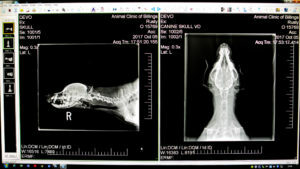 Our x-ray machine generates digital images that are stored immediately and permanently to your pet’s computerized medical record. The images can be enlarged, rotated and otherwise manipulated to more easily visualize and diagnose skeletal and soft tissue diseases. Additionally, the images can be burned to a CD for you to take home, or sent via the internet for specialist consultations. X-rays are used to asses for many internal conditions that cannot be otherwise detected. Examples include airway disease (e.g., collapsing trachea), pulmonary disease (e.g., pneumonia and bronchitis), fractures (broken bones), joint disease (inflammation and arthritis), congestive heart failure, internal masses/tumors, gastrointestinal foreign bodies, bone loss due to periodontal disease and tooth root abscesses among many more. A dog ultrasound is the second most common type of diagnostic imaging tool veterinarians use to diagnose a dog’s medical condition. We also perform ultrasounds to help aid in the accurate diagnosis of your dog’s illness. Sometimes it is helpful for a veterinarian to visually see how your pet looks on the inside, as certain issues do not show up with bloodwork. Common symptoms that may cause a veterinarian to use ultrasound include: vomiting, weight loss, kidney impairment or blockage and heart disease. WHAT IS A DOG ULTRASOUND? Ultrasound is a pain-free, totally non-invasive technique that uses high-frequency sound waves to produce a real-time image of your pet’s internal organs. Often considered more exact than radiographs, whereas radiographs show the contours and density of structures in the body, ultrasound provides a movie of what is happening inside your dog’s body. This allows for more in-depth assessment of heart problems and diseases of the abdominal organs, such as liver and kidney disorders, stomach and intestinal problems, adrenal disease, and disorders of the urinary bladder and reproductive system, as well as evaluate other areas such as the thyroid glands, testicles and mammary glands. Ultrasound can also be used to assist in collection of fluid from the abdomen for analysis, or needle biopsy samples from organs such as the liver and spleen, to aid in the diagnosis of disease. Ultrasound biopsies are minimally invasive, and have few complications compared to surgery for biopsy. However, ultrasound biopsies are very small samples; therefore in some cases surgical biopsy is more appropriate. Ultrasound also works well in conjunction with other diagnostic tools and a wide range of diagnostic procedures. For example, if an X-ray shows a lesion on your dog, an ultrasound can determine the origin of the lesion and whether it has spread elsewhere in your dog’s body. Using the ultrasound image as a guide, surgical biopsies can be obtained without major surgery and your dog can often go home the same day. Ultrasounds are typically not stressful for your dog and take anywhere from 15 to 30 minutes to perform. Whether it be an abdominal ultrasound or an echocardiogram, an ultrasound gives us a detailed image of various organ structures and their movement to better diagnose areas of discomfort, swelling, or infection – all in real-time! WHAT HAPPENS DURING A DOG ULTRASOUND PROCEDURE? In modern scanning systems like the one the Animal Clinic of Billings has on-site and uses on our canine patients, the sound beam sweeps through the body many times per second. This produces a dynamic, real-time image that changes as the dog ultrasound device moves across a dog’s body. We can use the results of an ultrasound to determine what is ailing your dog, and to devise the most effective treatment protocol. Dogs today are lucky compared to those in the past when it comes to diagnosing and treating health problems. Science has opened a whole new world of diagnostic imaging tests for our canine and feline fur kids that can see far into their bodies. So why then do so many pet parents dread hearing the news that our dog needs an MRI? MRI’s, short for Magnetic Resonance Imaging, are the newest diagnostic imaging test and the most expensive. They can cost $2,000 – $4,000. This is in part because the equipment runs as much as $1 million to buy and needs to be stored in a specially housed area to protect the rest of a hospital from its strong magnetic field. The magnet in an MRI is up to 40,000 times as strong as the earth’s magnetic field. Therefore it can ruin nearby computers and medical equipment. With that in mind, MRI’s are less harmful to a dog’s body than an x-ray because the scan doesn’t use radiation. HOW IS AN MRI PERFORMED ON A DOG? An MRI works by using a magnetic field and radio waves to create images that are clearer and more detailed than other type of diagnostic scan. The procedure can show abnormalities, injuries and diseases of the spine that may not be seen with any other method. An MRI scan magnetizes the cells of an organ while precise images are taken and sent to a computer that interprets the information. Patients lie flat on a table that slides into a domed-shaped machine that looks like a small tunnel. Your dog’s collar will be removed for the procedure to be sure there is no metal near the equipment. Because of the special nature of the test, we outsource all of our patients MRI’s at the Animal Clinic of Billings to a local specialty center designed for human care. This allows us to be able to afford to keep up with the most cutting edge technology and get your dog the best up-to-date care possible. Dogs almost always need anesthesia for an MRI because they have to be very still for the procedure. The sleeping dog is placed on a table that moves slowly through the MRI machine, which is shaped like a donut standing on its end. 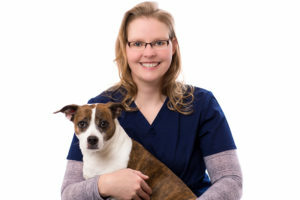 An MRI often takes more than an hour to complete, so the dog is under anesthesia for a while, but rest assured that one of our veterinarians is always there to closely monitor the dogs condition and ensure everything goes as smoothly as possible. WHAT CAN AN MRI SHOW A VETERINARIAN? MRI captures differences in tissue density. It can reveal tumors and other subtle lesions that might be difficult for a CT scan to reveal. MRI can also be done with the injection of contrast material as well to make certain things easier to visualize and diagnose. IS MRI SAFE FOR DOGS? The MRI procedure itself has no known negative effects on a dog. Unlike x-rays and CT scans, MRI does not use radiation. We ensure that all of our patients going into MRI have blood work done prior to the MRI, so if there are conditions such as kidney or liver dysfunction that might increase the risk of anesthesia, they are known. Otherwise, MRI is a non-invasive and fairly safe diagnostic tool. Echocardiograms are specialized ultrasound images of the heart that are far more precise than electrocardiographs. 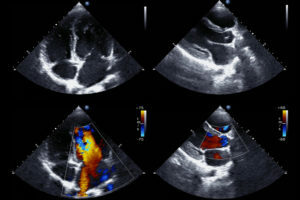 An echocardiogram creates a two-dimensional real-time video image of the cardiovascular system that displays the function of the valves in the heart, the contractions of the heart, blood flow through the arteries, and more. Another function of the endoscope is to aid the veterinarian in the removal of foreign objects. Often, animals swallow things that they should not, including toys, buttons, and in one instance, a sewing needle! Using the endoscope as a guide, the veterinarian may be able to remove such objects using a special instrument, rather than resorting to a major surgery. If your dog or cat has a heart issue or a heart murmur that has appeared to have gotten worse then we are ready to help provide you peace of mind by offering in-house electrocardiogram (ECG) testing at the Animal Clinic of Billings. Using the electrical activity of the heart, an electrocardiogram identifies problematic areas within the heart and is a vital diagnostic too for our veterinarians to pinpoint the problem and accurately identify the solution. For example, an x-ray might show some soft tissue swelling in the knee but the addition of an MRI would reveal the specific tendon or ligament tear that is causing a dog to limp and allow for a more specific treatment plan, diagnosis and prognosis. Veterinary diagnostic imaging offers an array of incredibly useful tools within a veterinarian’s toolkit. Sometimes a diagnostic imaging session can lead to the need for further diagnostics. This is why it is important to understand that diagnostic imaging may lead to a progressive fact-finding mission that must occur in order to diagnose your dog’s ailment. Are you concerned that your dog might be injured or experiencing internal problems and would like discuss how canine radiographs can benefit him or her? If so, please contact us to schedule an appointment with one of our veterinarians today and let us help you keep your dog as happy and healthy as they can be.